We met at our gym. I’d only joined the month before. As we looked up from what we were doing we found ourselves smiling at one another as we walked past and moments later we were chatting to one another and exchanging email addresses. It was Christmas eve and the room was unusually romantic with candles and a roaring fire. We had just watched a Muppets Christmas Carol (perhaps one of the best Christmas films ever made!). Every evening during the month of December we had sat down to open our chocolate calender (a wooden tree with boxes that force you to put in the biggest chocolate you can find to fill the box). I past one of the chocolates to Matt, as had become customary, and I picked out my little chocolate wrapper to find that there was no chocolate inside but instead a big diamond ring. Matt jumped down from the sofa onto one knee and began his proposal. My heart was dancing around and Matt gave a beautiful speech before popping the question. I’ll never forget that evening, it was perfect and every christmas brings back that feeling. When we first started dating we came up to the lakes quite a lot. Its not too far from where we live in the north west. It’s one of the most beautiful places a person could get married in and we wanted to get married somewhere that meant something to us. Also it’s a great excuse to keep going back to a place we love. 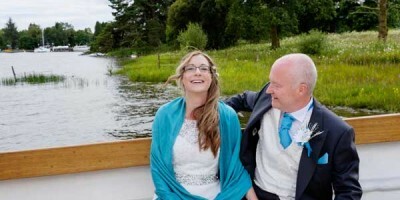 We got married at Low Wood Bay. I remember we first went there for Matt’s birthday and as luck would have it they were out of regular lake view rooms (which is what we had paid for) and had to give us one of their premier suits. The room was absolutely beautiful and by far the nicest room that either of us can ever remember having stayed in. The staff were so friendly at the venue and the set up of the function room and the dark wood paneled restaurant were ticking all the right boxes. We had been to quite a few places in search of a wedding venue but nothing was really appealing to us. Low Wood won hands down. On the run up to the wedding we stayed there quite a few times…always in the same room. We opted for ivory with the odd touch of dark red. My dress was Thee Dress. Getting the dress right was one of the most important things about the wedding (after the groom of course). Its something that I dreamed about since I was a little girl. I did end up with the ultimate fairy tale princess dress. Its a Naomi Neoh dress called Ava from her Iconic collection. Its an ivory colored french silk chiffon floaty dress and I wore it with the Fleur jacket and the Marlene belt. My something old and borrowed was a pearl necklace on loan from my mother in law and my something new was a new set of matching pearl earrings from the groom and the something blue was the blue ribbon on my garter. With so many beautiful photographs it is impossible to pick a favorite. But one that really stands out to me is when the both of us managed to get away from the guests for a few hours to go off into the hills. We are walking hand in hand down a lane and it looks like we are going off into the wilderness ready to start our new adventure…and that is exactly what it felt like at the time. I went to a number of wedding events/fairs/shows including the big wedding show in Manchester. Looking through magazines was really helpful to get a better idea of the sort of feel to the day that we wanted. I put together a scrap book of ideas including color schemes, and themes for everything from the stationary and cake to the dress and suits. In all seriousness the wedding day itself was long and tiring. For us getting the photography right was an absolute must. We got an amazing photographer and we wanted our shots to be natural and in the moment. Our photographer was so good its like he wasn’t even there most of the time, he was off doing his thing i.e. capturing the magic. Our guests on the other hand got a little snap happy and wanted to continually stop us to take photos. It ruined a little of the day because rather than enjoying our time with our guests, each other and our son we were stopping all the time to pose for yet another photo. I’d recommend telling your guests that whilst you are happy for everyone to take as many photos as they like, you’ve got a professional photographer so that you can spend your time just enjoying the day and not worrying about stopping for photos every minute. And that your guests can get copies of all the pictures so they should just relax and enjoy themselves. Also be prepared that some people aren’t always on their best behavior when they get drunk! The ceremony was absolutely fantastic. That’s definitely the main bit of the day. I had a huge gallery runway to walk down and although most of our guests kept commenting on how scary it must have been to walk that whole length by myself for me I was glad it wasn’t over to quickly. We did our own vows and had some of the guests do readings which we had put together ourselves. So many people commented on how wonderful the ceremony was because it was so different and personal. Absolutely! 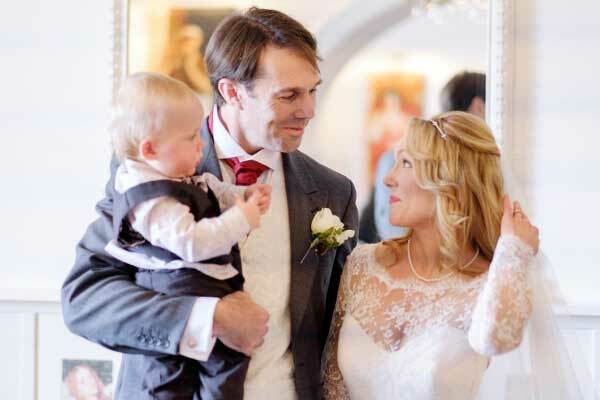 We are so pleased we picked Steve he was so great on the day and so helpful and our photos are absolutely amazing.